You are trying to modify the original teachings? No. The Buddha’s teachings are the same and you can refer any other sources to verify the teachings. We are only trying to make the teachings easy for practice in daily life. This may not be very helpful to Buddhist monks as they already follow the Eight Fold Path and know the Dhamma right. Buddha taught the same teachings to both Monks and Ordinary people, but only making it strict for the monks to follow the teachings, and as guide for ordinary people to reduce their suffering. It is not practical to follow the precepts in our daily life. You are definitely right. But when are we aware that what we are doing is practical or not. If it is practical to avoid doing an act do we actually avoid it. And it is always practical to follow the precepts in our thoughts. But still we think of killing, stealing, lying, smoking, drinking , etc. Buddha’s teachings were for eradication of sufferings. If we can avoid even one of our evil actions, we our sufferings are reduced to that extent. If we can avoid all our evil action and do good actions on understanding the real nature of sufferings, we will eradicate all sufferings from our life. I do not believe in the different worlds and the chart is mythical. You do not have to believe in the different worlds for the chart to be practical. There is no doubt that people fall down (are ashamed, disrespected, hated, ignored) engrossed with ignorance, lust and anger and others rise up (are loved, respected) freed from ignorance, lust and anger. Some people like hungry ghosts keep lusting after things and thirst is not quenched even after getting. Some are already wealthy and have power and still fight for more power and wealth for showing their status. Some are content. There should also be no doubt on the twelve links as they are straight forward. I have a different idea, which can make following the Eight Fold path much easier. You can follow any idea or technique that suits you. You can also share it with others on our website. Our idea of using the palm is that whenever we look at the palm we are reminded of the Eight Fold path and the Dependant Origination. The images are made such that you can easily associate and remember what part of your palm depicts what teaching. 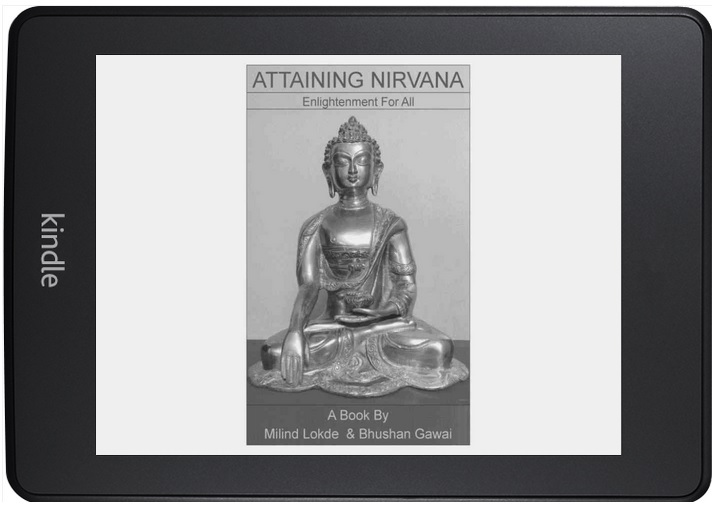 Will I really attain nirvana? Ans. Definitely yes. If it were not possible, then Buddha would not have taught it. Also if it was not possible, there would not have been so many Buddhists and so many opting to become monks leaving a pleasurable layman’s life. Is there anyone now I can meet who has attained Nirvana? Ans. There are many monks who have attained Nirvana. But usually no monk speaks of the level of progress they have made, which can lead to false pride. Also there are many sadhus & yogis in India who have got Moksha – Nirvana in Buddhist context, only that their values, principles and path differ from Buddhism. It is very difficult to follow the Eight fold path and to meditate. I also loose interest and do not follow it most of the time. Ans. It all depends upon the effort one puts on following the path. Putting too much effort gets one disappointed and looses faith. Putting too little effort doesn’t take one anywhere and he too looses faith. One should put right effort enough to remain on the path till one attains Nirvana. Where should I find a guide or right Buddhist teacher? Ans. No one is perfect until he has achieved Nirvana. But expect every monk to be a right teacher as they are very strict in following the rules of the monastery and usually know the teachings right. Other than monks, those people who are practicing Buddhism should provide you with the necessary teachings of Buddha, practicing meditation, providing guidance, etc. There are lots of books on Buddhism and some of them are even for free distribution that you can refer. Also the internet is full of references on every topic you have doubt for. This website may not be the best reference for the teachings of the Buddha, but it definitely is very good reference for practising and practical way of attaining Nirvana in today’s lifestyle.